John Glover was born in Salem, Massachusetts on November 5, 1732, and moved with his family to Marblehead where he grew up. 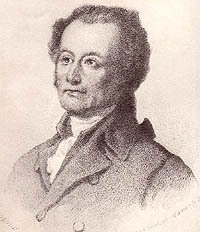 Just a few years after his marriage to Hannah Gale, Glover was appointed an ensign in the Third Military Foot Company, a Marblehead Militia Regiment of 1,000 men. He quickly rose through the ranks, eventually becoming a Colonel upon the death of Colonel Jeremiah Lee in 1775, in command of the Marblehead Militia Regiment (which he had originally joined in 1759). In June of that year, Glover and the Regiment were ordered to join the Continental Army encamped at Cambridge, Massachusetts. Recognizing Glover's leadership skills and resourcefulness, General Washington sent Glover to Beverly to protect that port against three British warships threatening attack. Soon after, Washington ordered Glover to commission and man two small naval vessels, the forerunners of Washington's Navy. At the start of 1776, the Marblehead Militia Regiment formally became the 14th Continental Regiment and was ordered in July to march to New York and later to Long Island. In August, Glover organized and supervised the evacuation from Long Island of 9,000 Continental troops and all of their equipment, guns, horses, and cannon, at night and under appalling weather conditions. In mid-October, Glover and 750 of his soldiers fought to a standstill a British force of more than 4,000 regulars. On Christmas night, 1776, Glover again proved his mettle when the 14th Continental Regiment ferried Washington and 2,400 men across the Delaware River at night, again in desperate weather, marched them nine miles into Trenton, fought a 36-hour successful battle there, marched back to the Delaware with 900 Hessian captives, and crossed back over the river again. Following additional distinguished roles in the war, including at the Battle of Saratoga and its aftermath, Glover retired from the Army in 1782. He returned to Marblehead, rebuilt his business, and went on to serve two terms in the Massachusetts Legislature and six terms on the Marblehead Board of Selectmen. He died January 30, 1797, at the age of 64.